← Tea plants as props? Thanks, #TeaAcrossAmerica! I first encountered Joy M. W’Njuguna and Royal Tea of Kenya back in 2011. I had blogged about Kenyan purple tea, and she offered to supply it for me. For a year or so, we had a great working relationship. We got quite a few excellent Kenyan teas from RTK, and Joy was always pleasant and easy to work with. 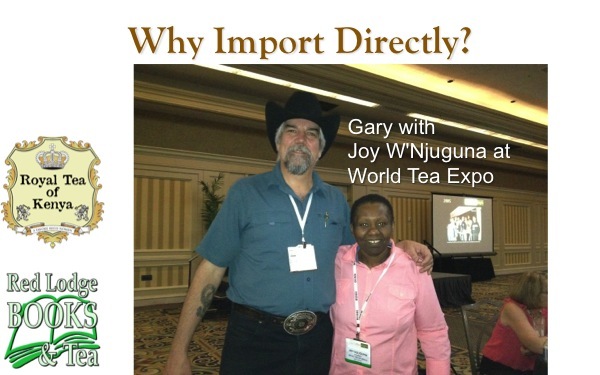 A slide from one of my presentations on African tea, showing Joy W’Njuguna and me together in 2012. I try to keep my blog generally upbeat and positive, so when problems started to surface with Royal Tea of Kenya, I kept them private. Our shipments got later and later. Tea that I paid for at World Tea Expo 2012 didn’t arrive for over six months, and I finally got her to ship something else instead. My last order, which I made the mistake of pre-paying, never arrived at all. For over a year, I have been calling and emailing Joy, and receiving a string of promises. At first they were promises to ship the tea as soon as it was ready. Then, after I told her I just wanted my money back, she’s promised a check in the mail numerous times. Nothing. Please don’t take this as a general indictment of Kenyan tea! Kenya, the world’s largest exporter of tea, produces some wonderful teas and there is a plethora of ethical tea businesses there. I am speaking specifically of Royal Tea of Kenya, which is a U.S. business based in Nashville, TN. It wasn’t until I heard from friends that they were having similar experiences with Joy and RTK that I decided I needed to make this public. I sincerely hope that none of the people she defrauded heard about Royal Tea on this blog, but I feel I have a responsibility to make sure I don’t send them any more business. There are two threads going on LinkedIn tea groups about the problem now. Numerous people are out hundreds of dollars each, and many of us made commitments to our customers based on RTK promises — commitments we were ultimately unable to fulfill. My experiences with other companies in the tea industry have been good ones. I’ve made some lasting friends in the world of tea, and learned a lot from some of them. Every barrel has its bad apples, and it appears that Joy is the rotted leaf in the tea basket (wow — that’s one of the most mixed metaphors I’ve ever posted here). The eternal optimist in me hopes that I’ll get a call from RTK saying “we’ve solved all of our problems and there a check and a box of tea is on its way to you,” but the eternal pragmatist in me has already written off that money. I will post updates here as I hear them. Posted on 15 May 2014, in Tea Biz and tagged African tea, Better Business Bureau, East African Tea Trade Association, EATTA, Federal Trade Commission, fraud, FTC, Internet Crime Complaint Center, Joy W'Njuguna, Kenya, Kenya Tea Development Authority, Kenyan tea, KTDA, purple tea, Royal Tea, Royal Tea of Kenya, The Tea Board of Kenya. Bookmark the permalink. 8 Comments. I’ve heard this from several tea industry folks. It’s a shame because she did have some really nice teas. I had odd run-in on Twitter with Joy when I reviewed a “purple” puerh. She replied insisting that only Kenya could have purple tea and demanded that I call her to discuss it. Hmmm. The tea industry can’t even agree on basic terminology for major tea styles. Can a fermented tea from Laos be called pu-erh or is it “dark” tea? Does “red tea” mean Chinese black tea or rooibos? Heck, there are still experts calling black tea “fermented” instead of “oxidized.” Yet she expects consistent use of the word purple? Joy stole $1000s from our tea company like many more. Same story as yourself. We did file a report with rtk for fraud. Nothing came of it. I see she still has a website, and is probably still stealing from trusting small businesses. She should be shut down. Certainly a rotten tea leaf. Joy also beat us for $1500 — we prepaid for all of our teas and she never delivered! She kept telling is that it was going to be sent — lied in each and every email or phone call. Joy W. Njuguna 48, of Roanoke, died Wednesday October 21, 2015. Memorial service will be held 11:00 a.m. Tuesday, October 27th, at Fralin Chapel, Roanoke Rescue Mission. Arrangements by Oakley’s Roanoke Chapel. So saddened to learn all this about Joy; she was a magical woman and gave us access to some incredible teas. No doubt the decline of her company was related to her own demise in some way or another, compounding a sense of loss. I was searching for her site to renew my order of Grandpa’s Anytime tea, the best ctc kenyan I’ve ever tasted, when I came upon this post. probably you don’t need my comments anyway as I see your post is from 2013, and evidently Joy passed away in 2015 after suffering ovarian cancer; I mentioned in my earlier comment that her Grandpa’s Anytime tea was ctc, but in fact, checking my own article on the 2011 WTE, http://www.nysun.com/food-drink/sin-city-goes-tea-total/87415/, I see that it was processed by orthodox method not ctc. perhaps to those who suffered fraud from this company it might offer some relief to know that the founder must have been quite “out of it” with her illness.